The important thing is not the type of therapy you will receive but the progress that we will make together. The key feature of any good therapy should include a valuing of the relationship, empathy, unconditional positive regard and respect. If these core conditions exist then other techniques will be especially helpful. CBT is a powerful tool that is extremely effective in the treatment of numerous conditions including depression, anxiety, eating disorders, substance abuse, OCD, post-traumatic stress and chronic pain. By identifying and challenging dysfunctional thinking patterns and responses, it is possible to replace these “errors in thinking” with more realistic and helpful thoughts. Cognitive Behavioural Therapy focuses on specific problems and strategies that will address those problems and enable you to swap faulty coping skills for more effective ones. Additionally CBT is the number one choice of therapy in the NHS and has a vast evidence base showing how effectively it works. 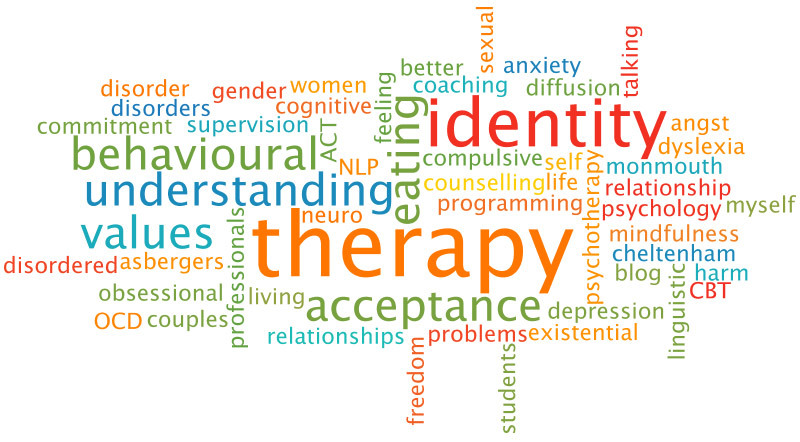 CBT can work quickly and fundamental changes in how you think and feel can happen within as little as six sessions. NLP is like software for the mind and enables you to change the way you think. It was designed to be a brief form of solution-focused therapy and is particularly effective in enabling you to manage stuck mindsets quickly. I incorporate NLP into the therapy as a whole but specific visualization exercises can be helpful to practice as homework. NLP harnesses techniques learned from the gurus of therapy. These techniques are a formidable set of tools that can change the way you feel fast. It stands for Acceptance and Commitment Therapy and incorporates skills such as mindfulness, diffusion from worrying or distressing thoughts and working with your key values. This is a 10 week course of treatment which incorporates the 8 week MBCT programme popularised by Ruby Wax in her book Sane New World. This is an evidence based course helping you overcome anxiety, depression and many other persistent psychological difficulties. The cost of this course is £500 or £450 if paid in full in advance.